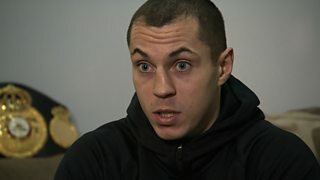 Super-bantamweight world champion Scott Quigg tells BBC Sport he dropped out of school to concentrate on boxing. Quigg was speaking before his unification clash with Carl Frampton at the Manchester Arena on Saturday. You can listen to exclusive live radio coverage of Quigg versus Frampton on 5 live and BBC Radio Manchester from 22:00 GMT Saturday.